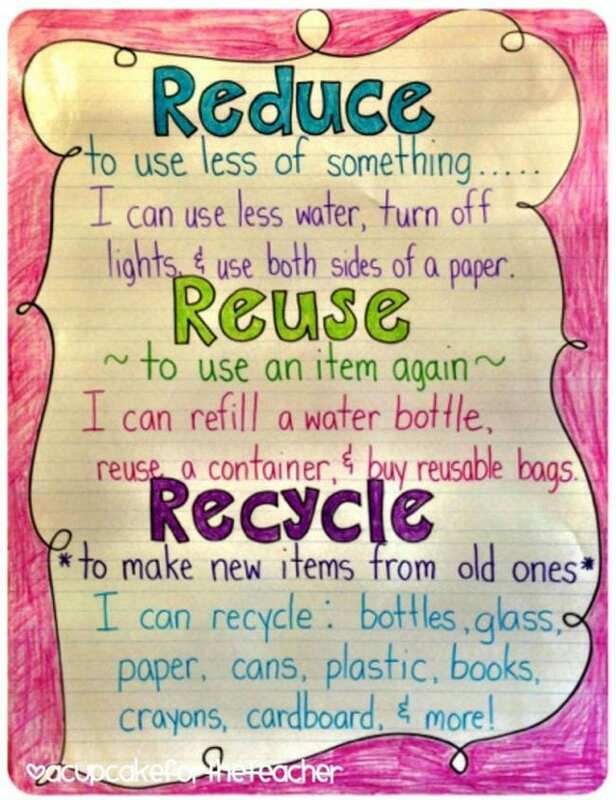 You can reuse these recycling anchor charts year after year! Recycle Rally is a free nationwide program that directly benefits K–12 schools and students by providing valuable incentives and resources to help make recycling easy, fun and rewarding. 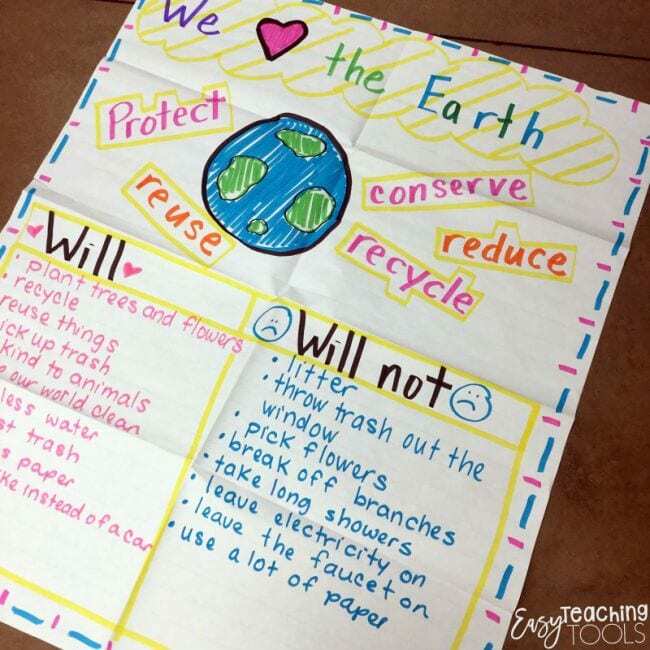 Don’t forget to make your recycling anchor charts reusable and eco-friendly! First, create the basic text and images. Then, laminate the chart. After that, you’ll be able to use dry-erase markers for students to add their own input over and over again. 1. Give love to the Earth. Start with the simple but eye-catching heart-shaped earth graphic in the middle. 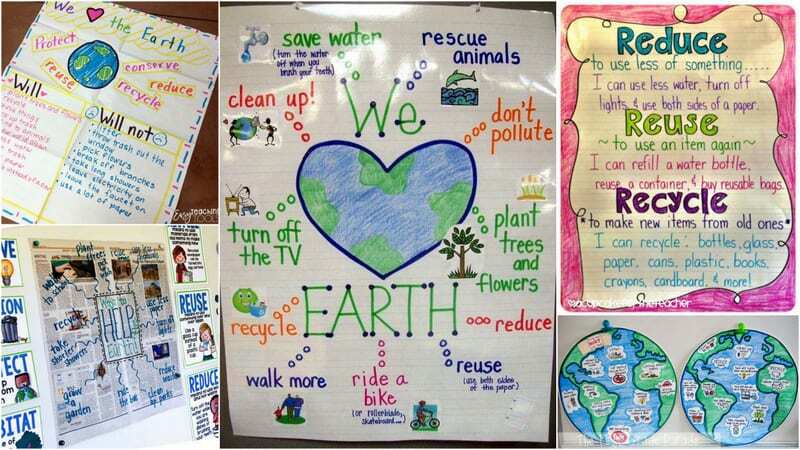 Then, have students help you fill in the activities of a true earth lover, like planting trees or saving water. 2. Use a familiar phrase. This famous phrase has been around for decades, teaching us all how to conserve and preserve. Create your chart with the basic terms and definitions, then work as a class to come up with ways to take part in each of the activities. 3. Focus on a strong message. 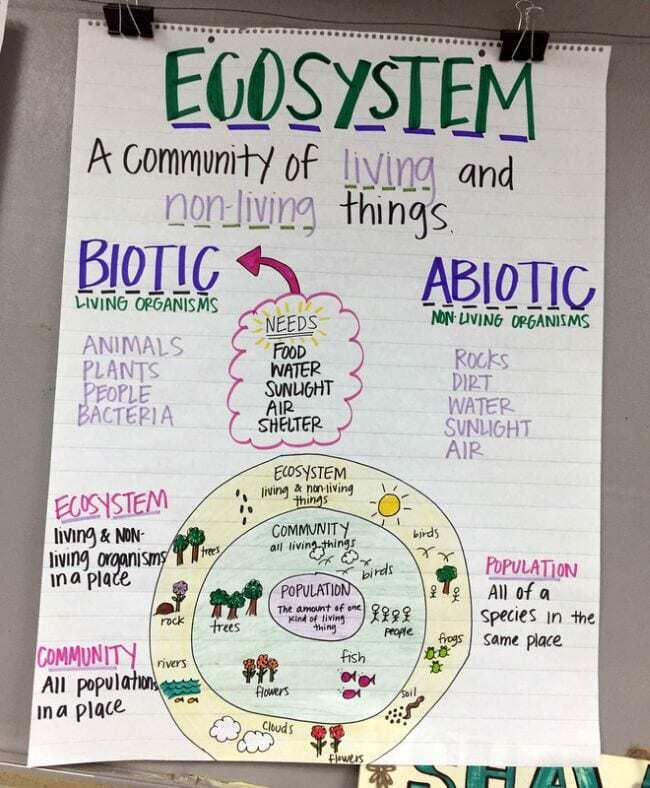 WeAreTeachers had so much fun creating this anchor chart with teacher Joe Dombrowski. (Watch it all the way through to see how we created this great anchor chart.) It’ll challenge your students to come up with their own answers, which will help them remember that they really can make a difference. 4. Borrow inspiration for your design. Do as I say AND as I do! 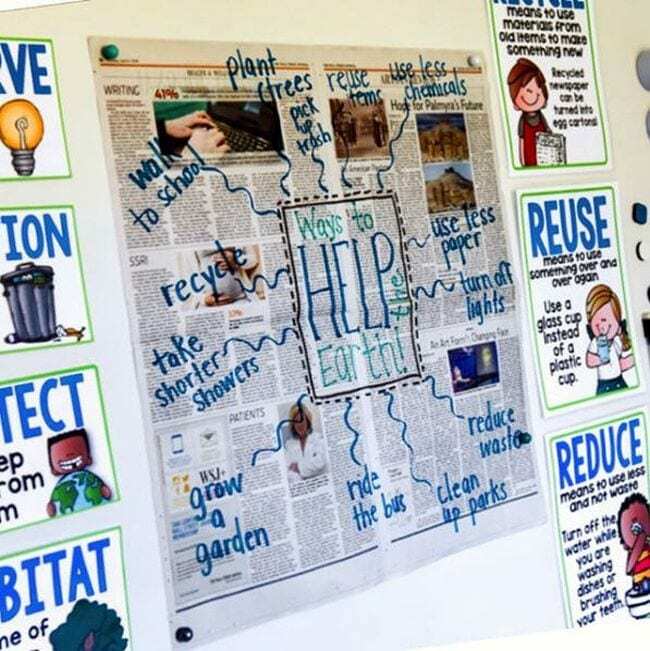 Let your recycling anchor charts put words into action by using old newspaper pages instead of new paper. Tip: Use bold markers to ensure your message stands out over the newsprint. 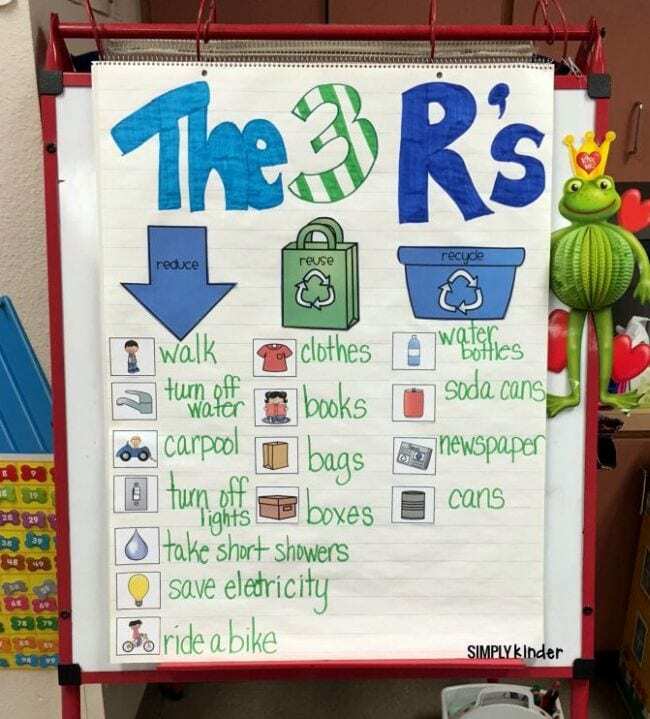 Go one step further with your recycling anchor charts and turn them into a pledge! 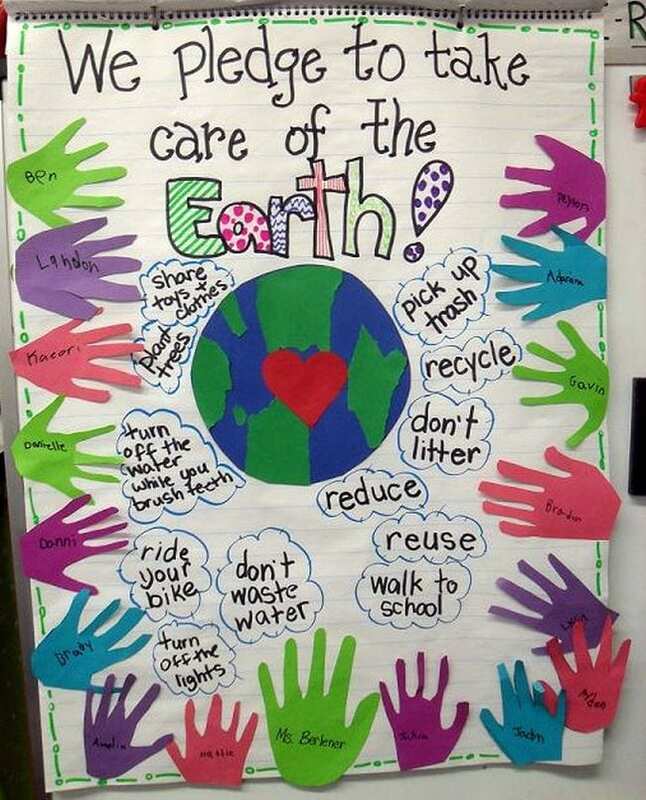 After students come up with a list ways to take care of the earth, use cutouts of each student’s hand to seal the deal. 6. Look at pros and cons. 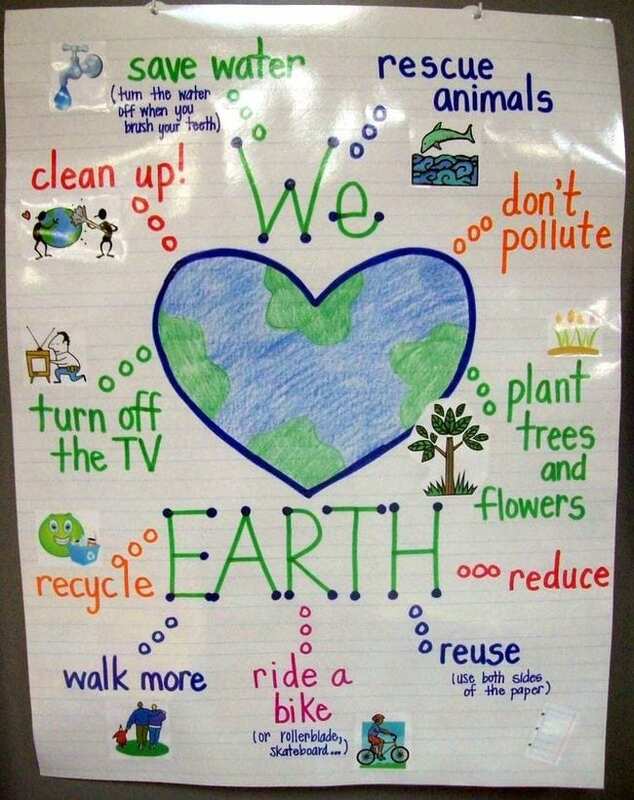 This simple chart helps kids map out good and bad behaviors when it comes to caring about the environment. Post it in the classroom and add to it as you go. 7. Try fun shapes and designs. Don’t limit yourself to an ordinary piece of chart paper! 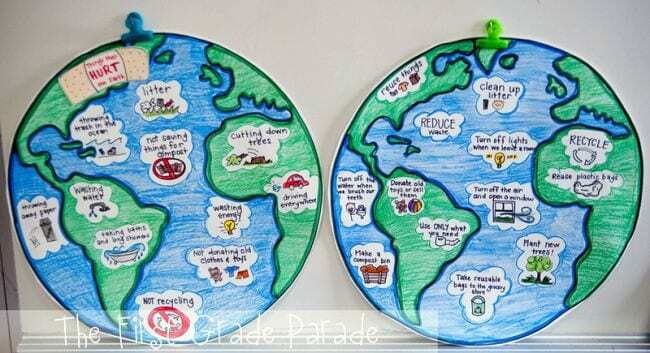 These globes are a fun way to remind your class that what really matters is what’s good for the earth. 8. Organize it into sections. 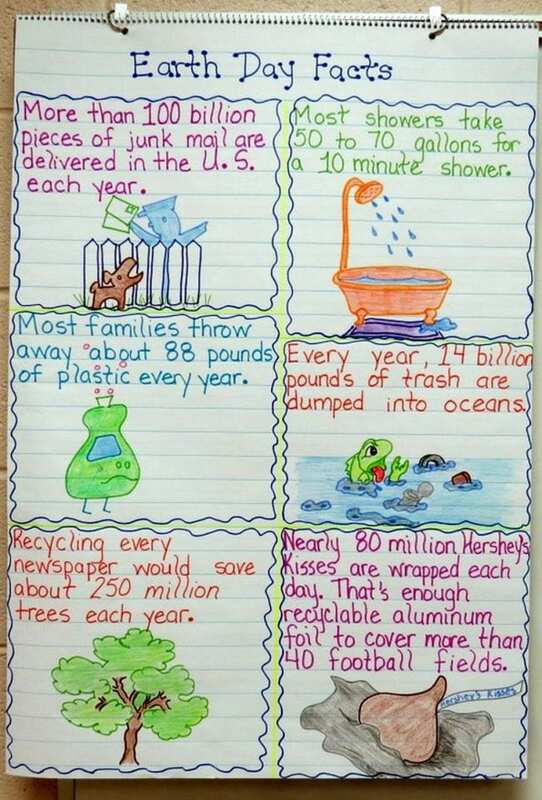 This is a simple way for younger kids to learn about sustainability. Print the free images from Simply Kinder and have the little ones help you add them to the right places on the chart. 9. Break it into two parts. Give your students a deeper understanding of why the earth is so precious. 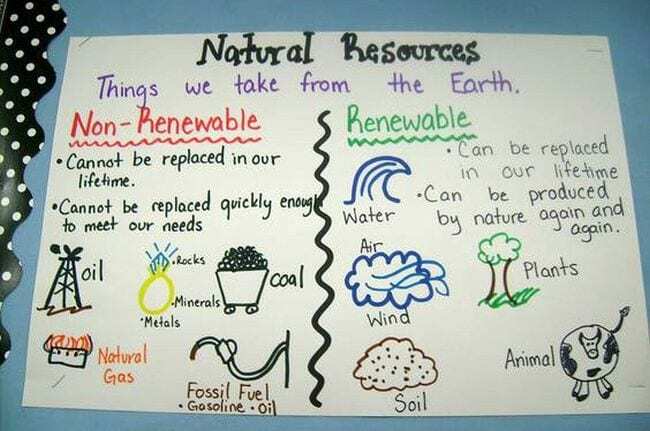 Once you’ve charted examples of renewable and nonrenewable resources, talk about how you can help to conserve and protect each. 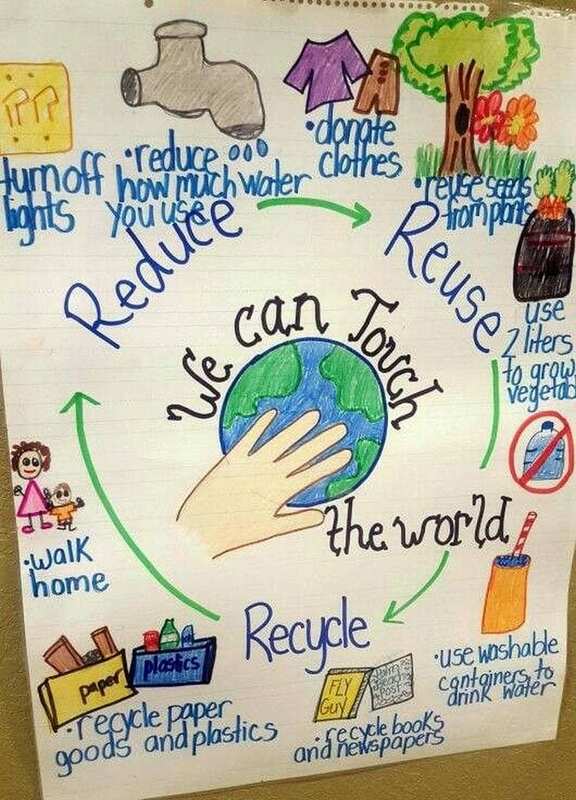 Remind kids that everything they do touches the world and others around them with this colorful recycling anchor chart. Have students gather facts from reading or research and use them to build an illustrated chart like this one. Kids will have a better understanding of why conservation and sustainability are so important when they realize how everything is connected. Learning to be a good citizen is one of the most important things you can teach in the classroom. 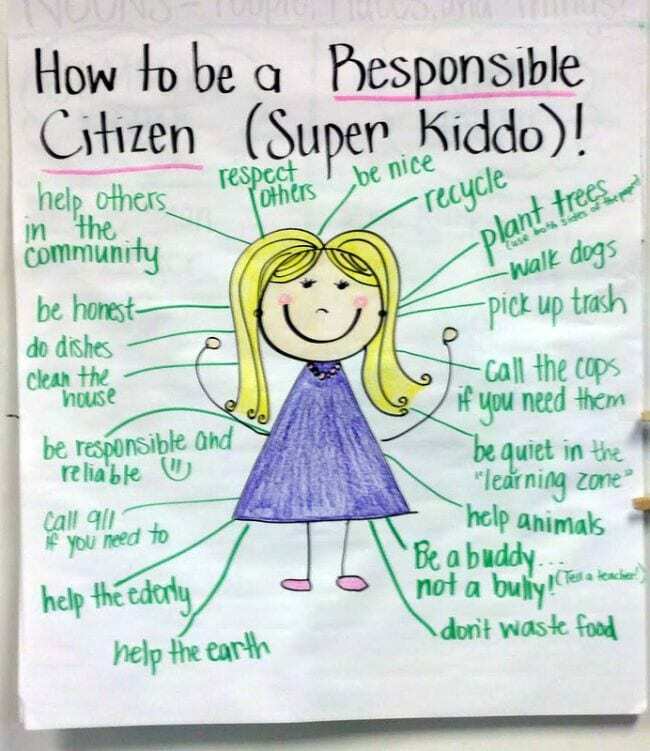 Incorporate conservation and caring for the planet into your citizenship lessons with this chart. 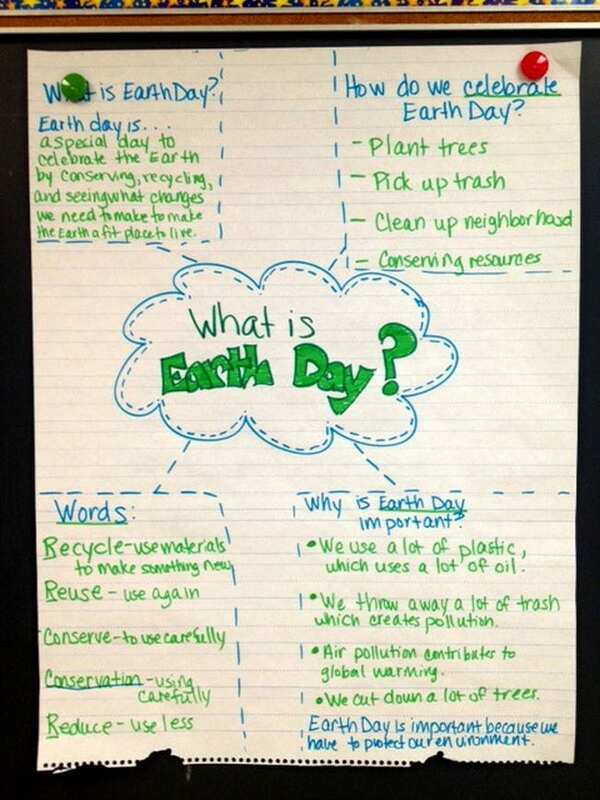 When Earth Day rolls around, create an anchor chart to explore what it is and why it’s so important. The vocab words corner is especially valuable. Are you looking for more recycling resources? Check out the printables, games, and more available from Recycle Rally.